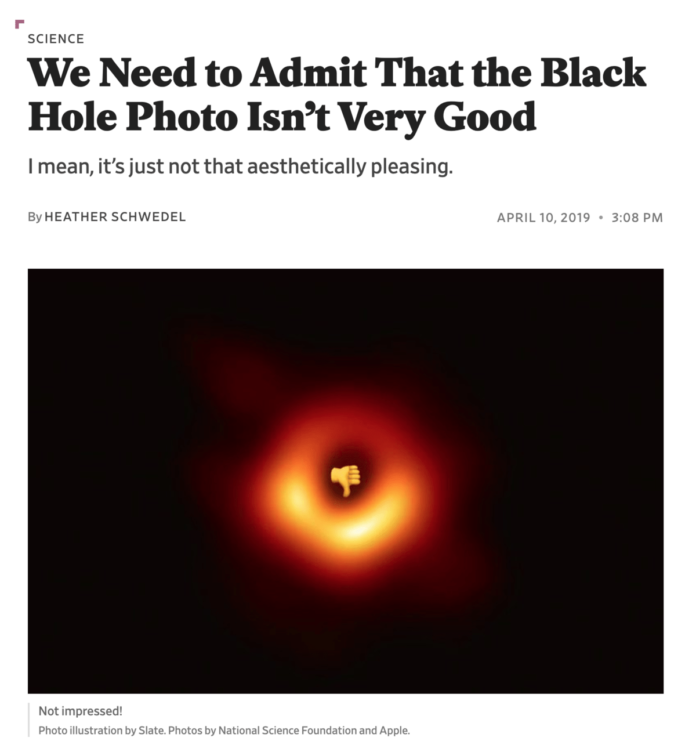 Slate staff writer Heather Schwedel’s attempted to make light of a multi-year research project to image a black hole that involved a consortium of over 200 scientists across the globe. In doing so, Einstein’s 100 year old General Theory of Relativity was proven (again), even though Einstein could hardly believe the implications of his own theory. Also not lost on many people was the incredible contributions of Dr. Katie Bouman, who led a team that developed the algorithm for crunching through the five petabytes of data that were required to create this computational photo. Women in STEM have a hard enough time already without having their accomplishments turned into a punchline. The trivialization brought to mind Lana H. Haroun’s photo of 22-year old engineering and architecture student Alaa Salah at a protest against Sudanese President Omar Hassan al-Bashir’s ruthless reign. Al-Bashir was ousted from power three days after Haroun posted the image. No image should be exempt from criticism – including both its appearance and how it was captured. But Schwedel’s piece is nothing more than snark – a cynical and unfunny reaction to an incredible achievement of computational imaging. Because we are petty. I think it is one of the most wonderful pictures picture I have seen in my life. Clearly ! too many people expected to see an image like in “interstellar”. And yet we have the most spectacular image of all the astronomical images ever made so far! they do not realize the size of the object nor the distance and even less the completeness of the technique used to extract such an image from the most difficult object that the universe has to image. I am moved/touched (sorry for my english) to have the chance to see such a spectacle! Also, no mention of this being a super crop of a much larger image. I guess you’re not familiar with the concept of jealousy.